Artist Camilla Gough weaves the landscape of love into bespoke engagement rings. Flicking through her Instagram feed, Kate finally found what she was looking for. Since becoming engaged, Kate and her fiancée John had been searching for an artist with a unique and bold aesthetic to design their engagement and wedding rings – and they had just stumbled across the work of Camilla Gough at e.g.etal. “We decided that if we were to be wearing rings around for the rest of our lives, they should reflect who we are as individuals and as a couple – not just add to the tradition of sporting nondescript gold bands and a rock, seemingly involved in a silent size war with the rest of the world,“ said John. John and Kate both respond strongly to the natural world, and were drawn to Camilla’s talent for translating landscapes and flora into bespoke jewellery – a process she has developed over many years working with couples for whom a sense of place is significant. John and Kate’s brief was filled with provocative visual language, with multiple points to ignite Camilla’s imagination. As well as their connection as a couple, the brief highlighted their differences: while Kate lives for the sun, surf and summer, John finds solace in wintry mountain scapes and pale moonlit skies. Material preferences also emerged: while John loves the look of mixed metals, Kate prefers the singular warmth of yellow gold. After carefully studying their brief, Camilla found inspiration at the point of connection: where the shore meets the mountains. 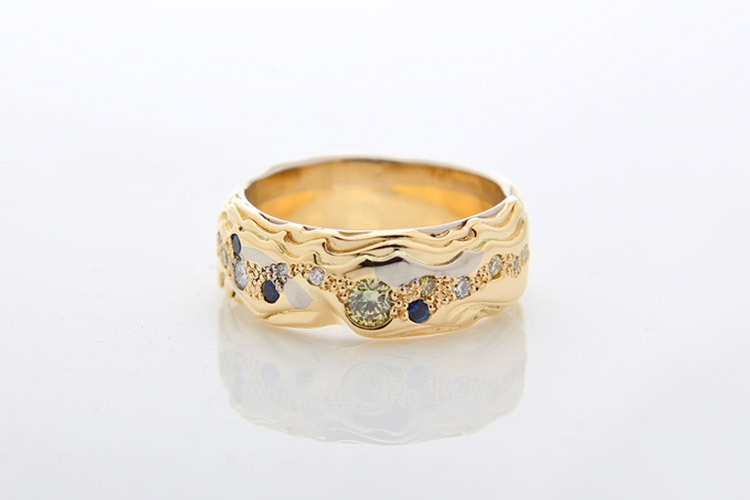 She designed unique but complementary rings, linked through carefully considered details. Kate’s engagement ring features stepped, carved edges and finely inlayed metals that follow the ripples of sand and water. At the centre sits a bright yellow diamond – an image of sunshine – surrounded by Ceylon blue sapphires and more glittering diamonds. As a further conceptual link between the rings, at the very edge of Kate’s ring is a slither of white gold. 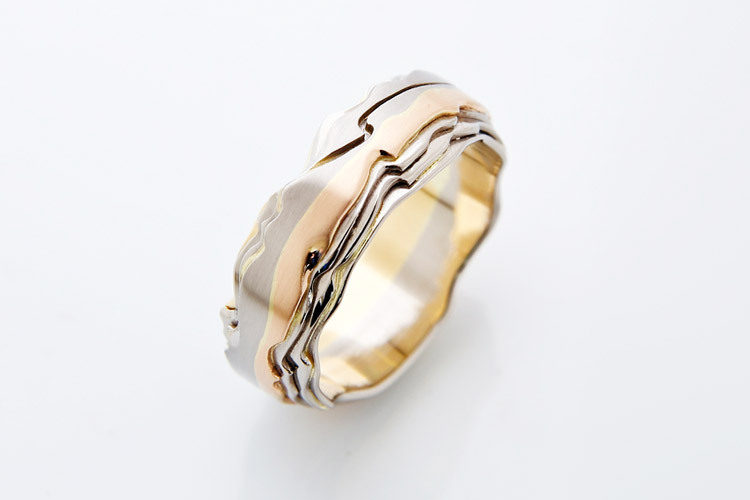 On John’s ring, a matching thin edge of yellow gold provides a continuum. 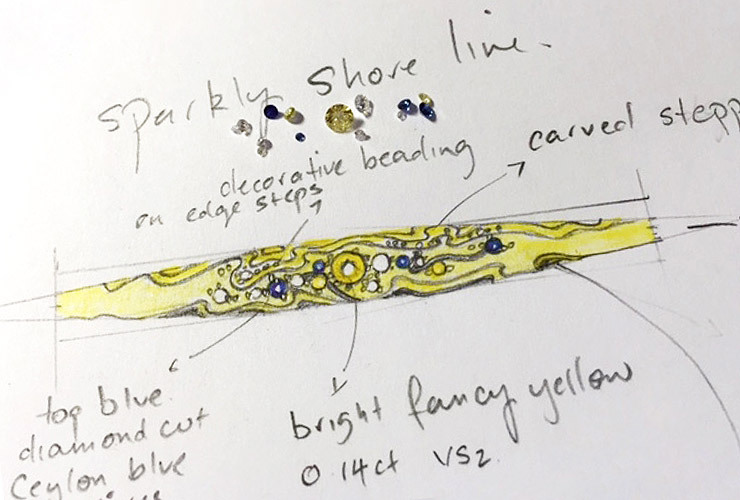 When Camilla showed the couple her sketches, the reaction was immediate: “I think I’m safe in saying that both of us were thrilled with Camilla’s interpretation of the brief,” says John – a feeling that was amplified once the handmade rings were delivered to the couple. “I was stunned when I first saw the finished products. 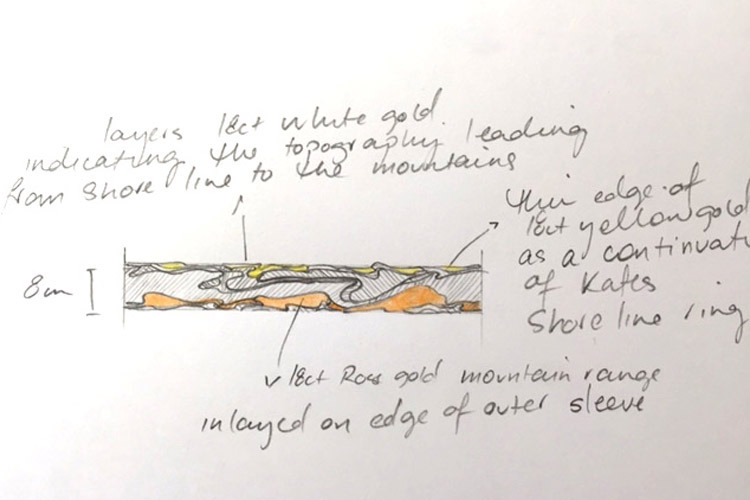 The brief came through far more in the physical item than it had done in the sketches, especially the differences between Kate’s shoreline rings and my more mountainous concept. 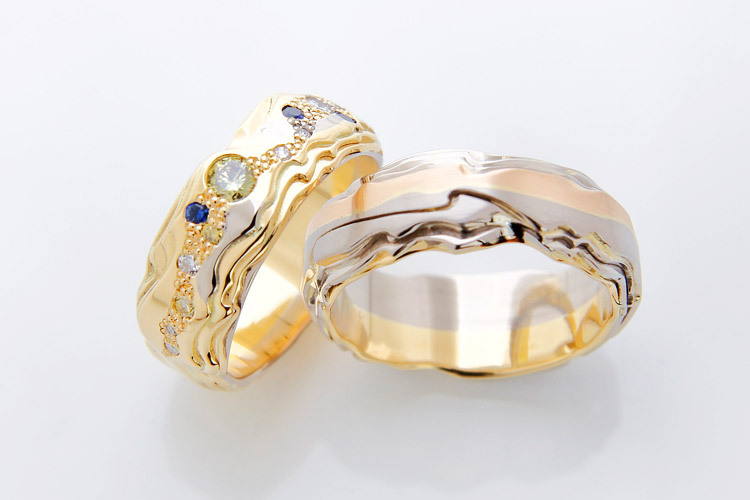 The shine and sparkle of the shoreline rings was Kate to a tee – real summer rings; while the darker tones in my ring suited my winter tastes perfectly. For Camilla, it is as important to listen to what is said as it is to consider what is unsaid: to intuitively consider the wearer. For John and Kate, allowing Camilla artistic freedom was an integral part of the process. “I wanted Camilla to make her own interpretation of the concepts, rather than me meddling with the design. My partner was initially unsure about the colours of some of the stones but is very glad now that she decided not to change anything – putting trust in Camilla’s design proved to be the right move. With a wedding still in the works, John’s band is yet to make its public debut. “But I do find myself getting it out of its box from time to time and I love it more each day. I can’t wait to wear it! 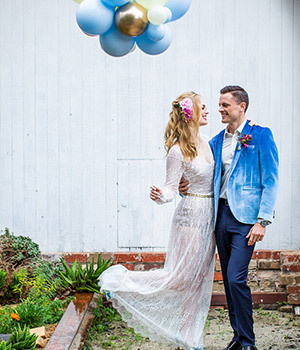 This styled wedding shoot took its cue from foraged berry florals and a pale blue waterfall. 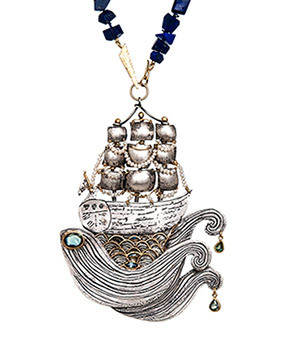 Jennifer Martin creates an epic jewellery piece for a client’s special birthday: An opulent ship necklace full of movement and detail. 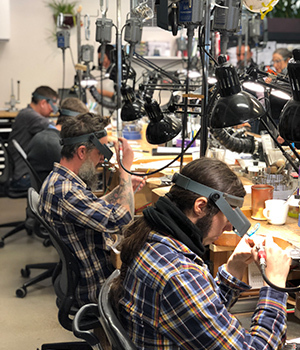 We visited Reed’s studio in Boulder, Colorado to meet the artist and expand e.g.etal’s exclusive collection.